Let's talk ground targets, guns and WWII aircraft. The Operation Epsom Campaign for DCW World, has you strapped to a Spitfire in an armed recon role. The Spitfire LF Mk. IX featured can't carry bombs so you are limited to your guns. 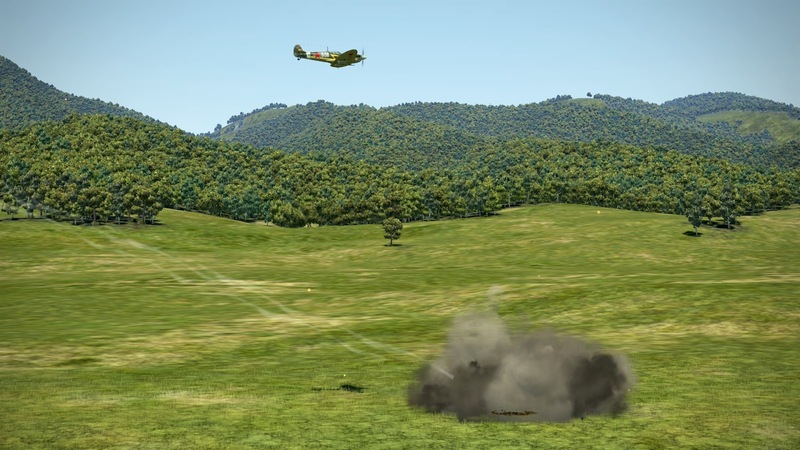 Strafing by aircraft in WWII is a great topic that I would like to explore in this blog post. There is probably no better book (at least in english) about WWII strafing than Colgan's Allied Strafing in World War II: A Cockpit View of Air to Ground Battle. This highly recommended book, although oriented mostly on the American P47, will help you to get into the "strafing mindset". This blog post is focused in the Spitfire, but most of the same principles can be applied to other aircraft. 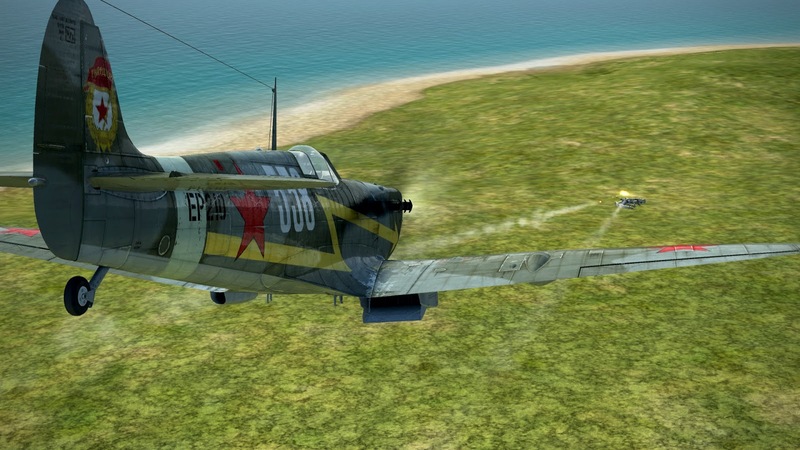 My first exhibit is a quick mission in IL-2 Sturmovik Battle of Kuban, in which I'm flying a Soviet Spitfire MKVB. 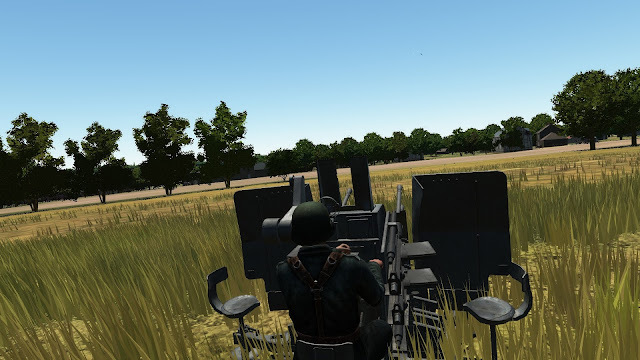 In this quick mission, I strafe German targets that can't shoot back at me (artillery positions), which is great practice. A video recording of this mission is available below (please visit the YouTube version for full HD). First things first, it is advisable not to dive down at full speed towards your target. At 03:20 in the above video, I put my engine's rpm below the 3,000 mark. At which speed to strafe? It depends on the aircraft. According to Colgan's book for the P47 it was 270 mph. High speed dives result in a very unstable aim, a lack of time to correct it and off course the danger of hitting the ground. For the Spitfire, I find a speed of 220 mph as the one that allows one to aim properly. In Colgan's book there is a mention of the so-called "boresight speed" (08:34 in the video above), which is the optimal speed to strafe. It all has to do with the harmonization of the guns (at which distance they converge), and the amount of time that the target is kept at that distance. The higher the speed, the shorter that fraction of time you have to pull the trigger. It takes some practice, but it will come to you: the "sight picture" (how big the target looks like compared to the sight). At 10:26 in the video above, I can distinguish some features of my target. At this distance, it is rare to miss hitting a target. In this particular scenario (the ground target can't fire at me) I wait until the target is really close to unleash my cannon rounds. At 10:30, my rounds come out. Note how I'm not hosing or walking my rounds towards the target. One has to remember that a very few seconds of firing are available. So don't waste ammo. In this case, since the ground target can't fire back, I have no problem getting very close to it before shooting with a lot of precision. This will prove different when you are confronting AAA, though. Pulling out at ~70 feet was standard practice. In this case, I pulled out from the dive very early. Another good piece of advice is to not get too fixated with the target. If you see it hit, just pull out from the dive. Depending on the situation, as soon as you see the rounds hit the ground, it is time to pull out. Other thing that affects your pull out altitude is how much your aircraft mushes. 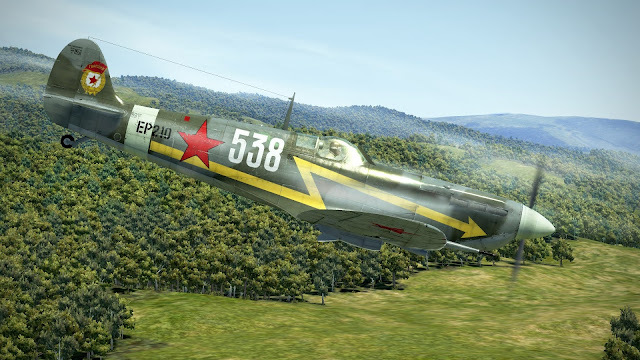 I haven't noticed too much tendency for that in the Spitfire, so I just enjoy the Gs. Now, when the ground targets are shooting at you. Well, that's a whole new game. Let's move onto DCS Normandy. 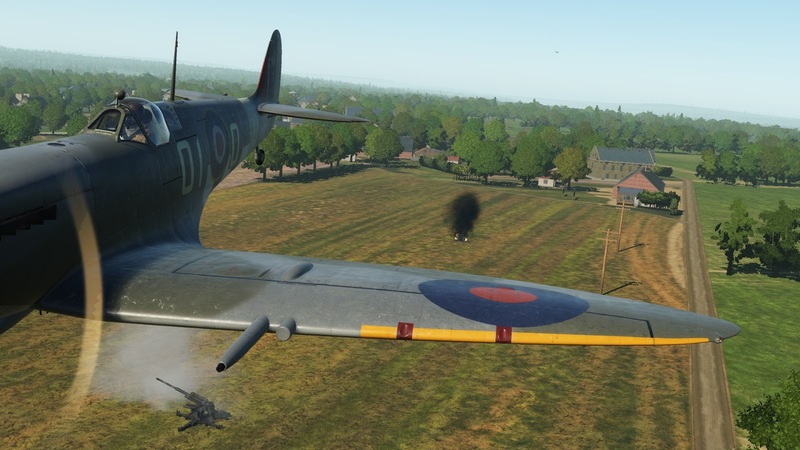 I created a practice mission featuring a flight of Spitfire LF Mk. IXs against two German AAAs. In the following video, I am against a Flakvierling 38 and another garden-variety flak 88 (the latter didn't worry me too much as it needs a lot of time to acquire a target). I started this mission very high. I reduced the rpms of the engine to make sure my airspeed was relatively low and then I started a shallow dive towards the field in which my targets awaited. At 00:25, I am trimming my elevator and rudder for the dive. This is very important to stabilize the airframe and ensure good aiming by means of trimming rather than simply stick and rudder pushes. At 00:37, at least the 88 is visible in the field below. The Flakvierling 38 becomes visible a second or so later in the video (it was visible in the simulation a few seconds before but the video compression ate it). At 00:42, I shoot a few rounds, which impact all spread without hitting my target. Four seconds later, the target is clearly visible and my shooting becomes more precise. The Flakvierling is hit and gone (see the black smoke below in the fly-by view at 00:54). For this mission, I started firing way before than in the previous one. The reasoning is that in this case, the threat is significantly higher. I hope you enjoyed this blog post. I will continue practicing and hopefully getting more success in Operation Epsom. So cool! I've watched a lot of color gun cam footage of P47's strafing targets in Europe. It's incredible the amount of firepower unleashed by 8 .50 cals. Also the precision with which they were aiming... some tried to target tanks by bouncing AP rounds off the ground and up into the soft bottom. Some of the footage was a little scary, like when they would have to take out horse drawn wagons full of ammo. I felt sad for the horses. Bloody hell, games nowadays looks positively unbeliavable!